In a recent report, NPR featured a story about the missing link in the fight against Ebola: anthropologists. At a time when even military forces are deployed on the ground to support the fight against Ebola, anthropologists are still struggling to get recognition of their own important contribution. “Any situations of infectious contagion are highly social. It’s an incredibly intimate process, and anthropology is a science of intimacy, of intimate connections,” said Ann Kelly, a senior lecturer at the University of Exeter, in the NPR-interview. There are numerous fears and culturally specific ideas involved in the interactions between people in Ebola-affected countries. And this is not only about stopping to shake hands. 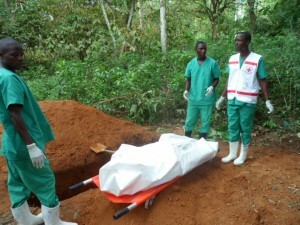 Anthropologists’ contribution to understanding the social and cultural implications of Ebola is particularly essential when it comes to local rituals and practices, such as funerals. The burial ceremonies have been changed for reasons of hygiene, but anthropologists have tried to reconcile this need with local culture. For the communities with whom we spoke, death is a journey, and for this journey one needs to be equipped with materials such as clothes that need to be washed and ironed before the coffin is closed. Critically, the dead person can also transport things for others in the afterworld. Attending a burial, even entering into physical contact with the dead body, is seen as an obligation not only to the living, but also to previously deceased kin. The local population has reacted to these changes too, as some residents in Liberia, the country with the most deaths from the disease, have reportedly tried to hide sick relatives in homes and churches. The local population has also become suspicious of aid workers themselves, a reaction that has not always been understood the right way. “I think people know that health care workers are dying and sick, so the prospect of being taken into a health facility is probably quite scary,” Kelly told NPR. Understanding such responses as rational and justified scepticism would already be a first step towards building bridges between the important work of health care and the local population, she added. The helpless reactions of local and international government to the ebola outbreak heap even more tragedy on this catastrophy that already defies description. There is much more that critical anthropology can and should do. It should speak often and loudly about the systemic reasons for epidemics. Epidemics are NOT brought about by the pathogenes alone. Pathogenes have always existed and wil always exist, but only rarely they evolve into a dangerous epedemic, the reasons for that are well known. Pathogenes need the social conditions to thrive and evolve to a genetic population that is capable of waging the destruction of an outbrake of of this magnitude.